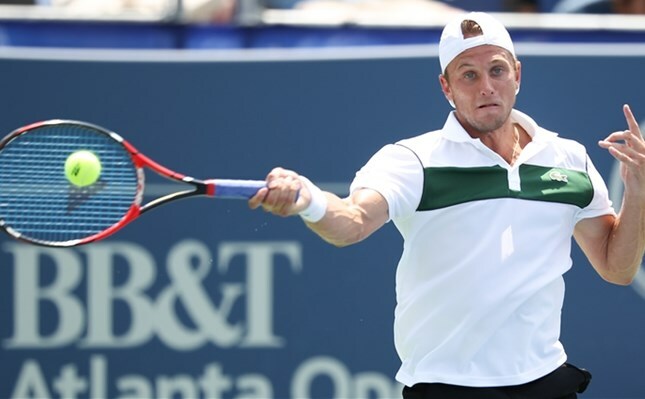 Denis Kudla’s fortunes have taken a turn since switching coaches. The 22-year old American is 17-3 since adding Billy Heiser to his team and into his first ATP World Tour this week in Atlanta at the BB&T Atlanta Open. To say Kudla is on a roll this summer would be an understatement and with his 7-5 6-0 drubbing on 2014 BB&T Atlanta Open finalist, Dudi Sela of Israel, Kudla is showing his success on grass this summer in England wasn’t a fluke. Kudla reached the fourth round of Wimbledon earlier this month. As a result of the coaching change, Kudla has relocated to Florida and is now based in Tampa. That means he gets to practice with his semifinal opponent, American John Isner. He’ll get that opportunity because the two-time defending BB&T Atlanta Open champ John Isner blasted 19 more aces on Saturday against a flustered Ricardas Berankis in a 7-6(5) 6-4. “The ball was moving fast and when the points are short, that is usually in my favor,” stated the former University of Georgia All-American. Isner converted on 68% of first serves for the match and saved the two break points he faced. He said that saving those two break points gave him the confidence to pull ahead. “You see a lot of times where the guy fights off a tough service games and then breaks,” added the six-time semifinalist. The 30-year old Isner has received attention on his left knee from the ATP World Tour trainer in both of his matches, but he says it’s nothing to worry about as he attempts to three-peat.